Our handmade Yoshihiro Hongasumi knives are crafted with extraordinary skill by our master artisans to create high quality knives that are indispensable in their craftsmanship and performance. Blue Steel #2 with a hardness on the Rockwell scale of 63 to 64, is forged with iron to create beautiful mist patterns, and an emphasis is placed on refined forging and polishing with the highest attention to detail. Our Yoshihiro Hongasumi knives are incomparable in their craftsmanship and performance. Yoshihiro Hongasumi knives are complimented with a traditional Japanese style handcrafted Magnolia wood (Octagonal Shaped ) handle affixed with a Water Buffalo horn bolster, and a protective wooden sheath called a Saya is included, which protects the knife and adds to its appearance when not in use.The Kenmuki knife is a traditional Japanese knife that is used for smaller precision tasks and can intricately carve and style vegetables and fruits for beautiful presentations and garnishes. Even the simplest of tasks are elevated with a handcrafted knife that is as beautiful as it is functional. 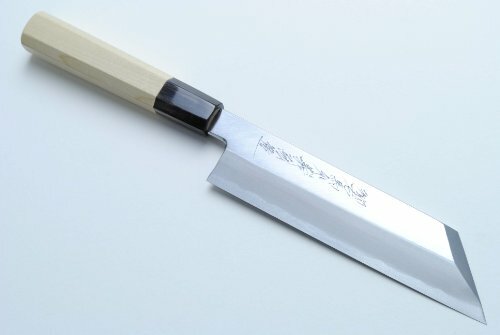 Although traditional Japanese carbon steel knives are not stainless, with proper care they can provide years of enjoyment. Keeping dry in between usage, and applying Tsubaki Oil (as included) before storage will keep your knife in tip top shape. Japanese knives should always be sharpened and honed on premium quality Japanese water stones. For maintenance info and professional Japanese knife sharpening contact our Yoshihiro Cutlery store.